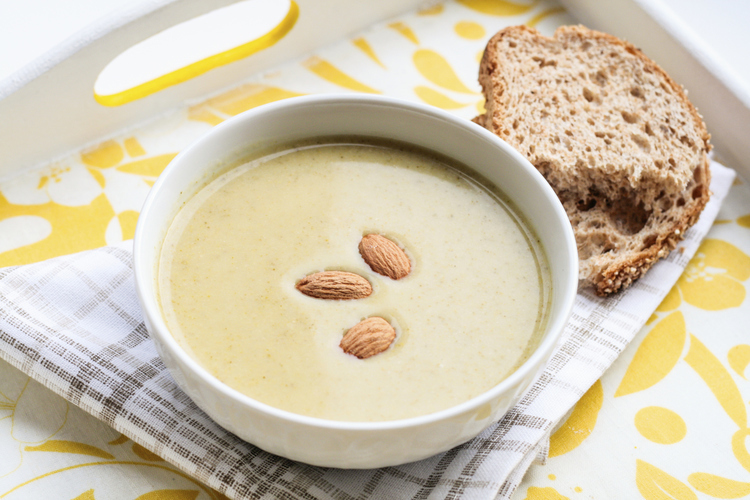 Soup can be your best friend when it comes to comfort food. These are easy to make, tasty to eat and will put a check on your calories too. 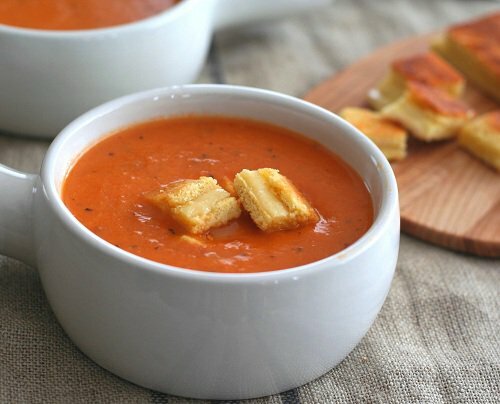 New Woman shares 5 delicious soup recipes here. 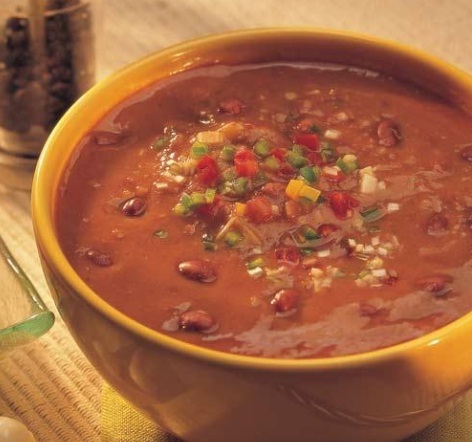 Soups can be used in a lot of ways. It can be a appetizer, a healthy afternoon snack, a late evening binge on and delicious comfort food to lift up your mood at any time. 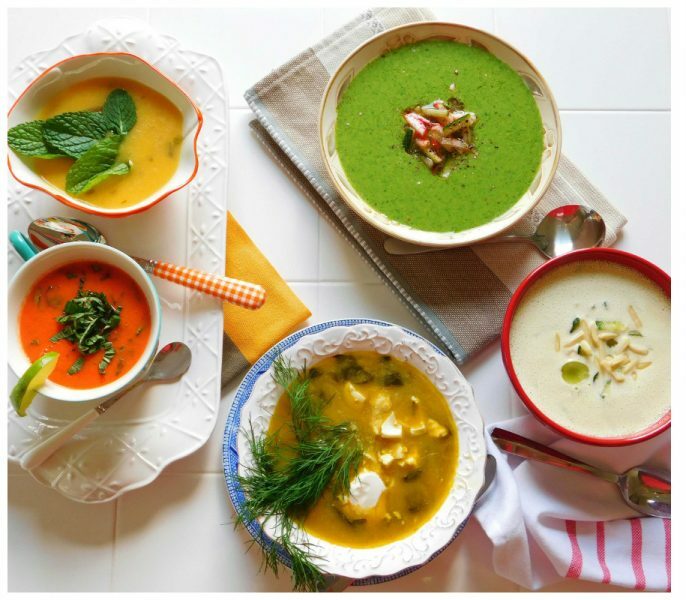 New Woman curates these soup recipes to make your life yummier. Method: Wash and cut tomatoes into quarters. Peel, wash and chop garlic, carrots into roundels, celery, onion, basil leaves. Heat oil and butter in a pan, add bay leaf, peppercorn, sliced onions and saute until translucent. Add the chopped garlic and celery, stir-fry briefly. Add carrot roundels and tomatoes, stir-fry for a minute and add three cups of water and boil. Cook for ten to fifteen minutes. Strain the blended mixture through a strainer. Remove peppercorns and bay leaf from the residue and allow it to cool. Blend in a mixer to get a smooth puree. Pass it through a sieve or strainer. Add the reserved liquid to the pureed tomatoes and adjust the consistency. Put it back on heat. Add salt, freshly crushed peppercorns and let it simmer for a couple of minutes. Just before serving, add the basil leaves. Method: Soak the almonds in hot water for 20 minutes, drain and remove the skin. Blend the almonds in a mixer till coarse. Keep aside. Heat the butter in a deep non-stick pan, add the plain flour and sauté on a medium flame for 30 seconds. Add the almond coarse paste, white stock and salt, mix well and cook on a medium flame for 3 to 4 minutes, while stirring occasionally. Add the fresh cream, salt and pepper and mix well.Serve hot garnished with almond slivers. Method: Heat the oil in a pressure cooker, add the onions and garlic and sauté on a medium flame for 1 to 2 minutes. Add the tomatoes, mix well and cook on a medium flame for 2 to 3 minutes, while stirring occasionally. Add the rajma, chilli powder, salt and 2 cups of water, mix well and pressure cook for 4 whistles. Allow the steam to escape before opening the lid. Allow the mixture to cool completely and blend in a mixer to a smooth purée. Transfer the purée into a deep non-stick pan, add ½ cup water and mix well. Bring to a boil and cook on a medium flame for 2 to 3 minutes, while stirring occasionally. Add the lemon juice and mix well. Serve hot garnished with yellow capsicum, green capsicum, spring onions greens and tomatoes. Method: Combine the beetroot with enough water and pressure cook for 4 whistles. Allow the steam to escape before opening the lid and peel the beetroot and chop them roughly into big cubes. 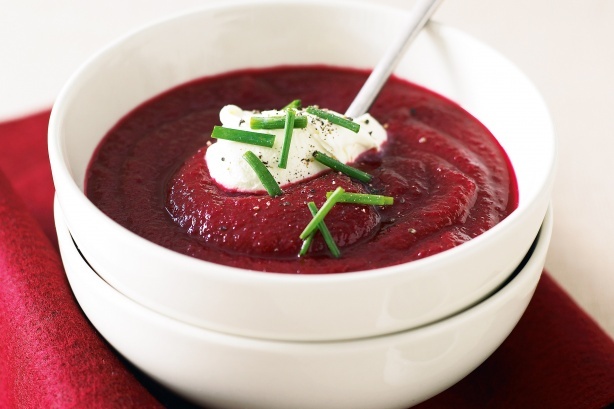 Combine the beetroot cubes with ¾ cup of water and blend in a mixer to a smooth mixture. Strain and keep aside. Heat the butter in a broad non-stick pan and add the plain flour and cook on a medium flame for 1 to 2 minutes, while stirring continuously. Add the milk and the beetroot mixture, mix well and cook on a medium flame for 2 to 3 minutes, while stirring continuously. Add the salt, pepper and fresh cream and cook on a medium flame for 2 minutes, while stirring occasionally. Serve hot. salt and freshly ground black pepper (kalimirch) to taste. 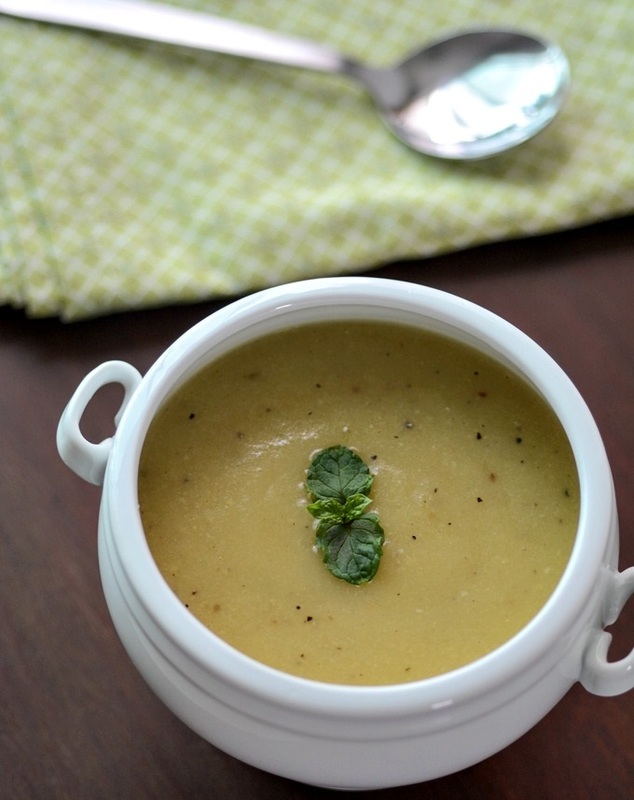 Method: Combine the bottle gourd, onions and potatoes along with 2 cups of water in a pressure cooker, mix well and pressure cook for 3 whistles. Allow the steam to escape before opening the lid. Cool completely, once cooled, blend it in a mixer till smooth. Transfer the mixture in a deep non-stick pan, add the white sauce, salt and pepper powder, mix well and cook on a medium flame for 2 minutes, while stirring occasionally. Serve hot.